I choose the name ‘Karlsruhe’ as this was the place in Germany where SV dog no.1 - Horand von Grafrath - was spotted and purchased by Captain Max von Stephanitz and subsequently won first place in 1899. German Shepherds are not just a passion, they are a way of life. My dogs are valued not just for showring successes but as part of my life and family. Championship Breed Specialist Show Judge. Qualified Breed Surveyor. 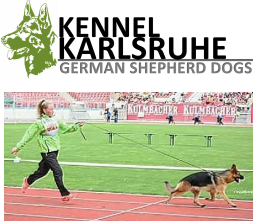 Karlsruhe German Shepherd Dogs is registered with the Irish Kennel Club (IKC) on a 'Life Basis' since 1983.